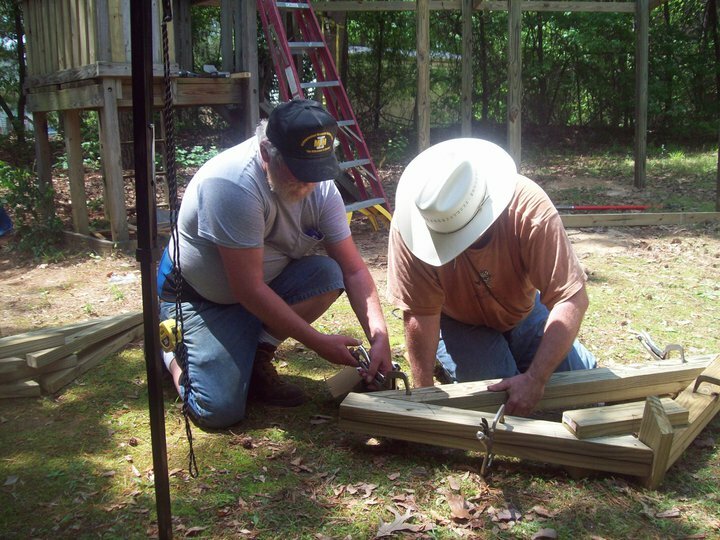 The entries for this construction are posted in REAL CONSTRUCTION TIME! 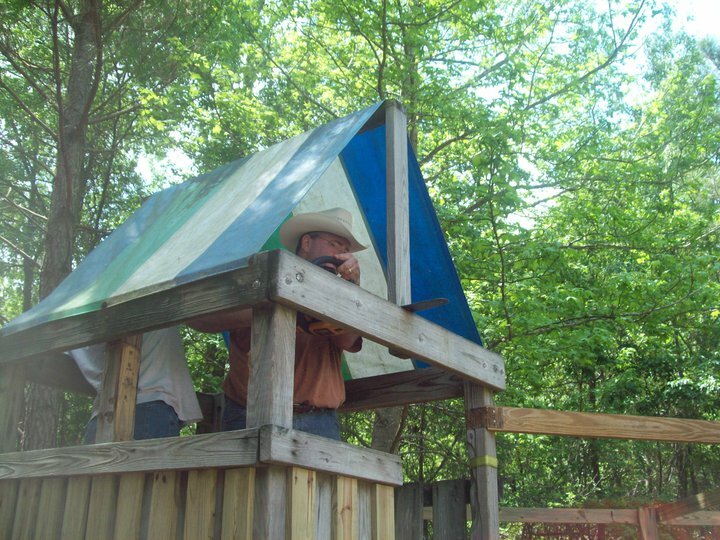 Here is the tour after I installed the solar and Wind turbine power. 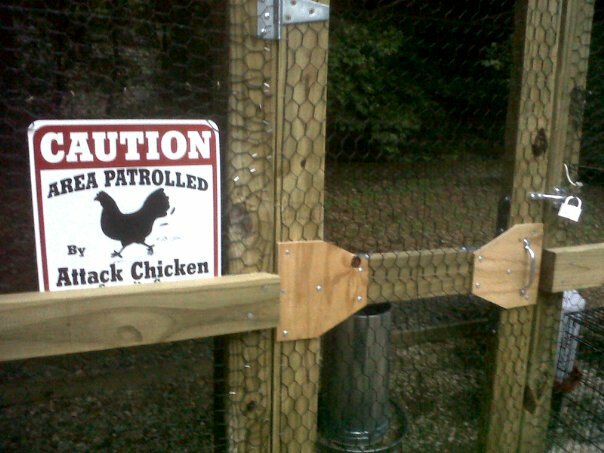 yes, this coop got all kinds of ridiculous oppulant!!! To begin with, Yah Gotta have a PLAN! All I got done was staking out the construction lines...Then the Sky FELL! Dug holes, to pour concrete to set the posts. 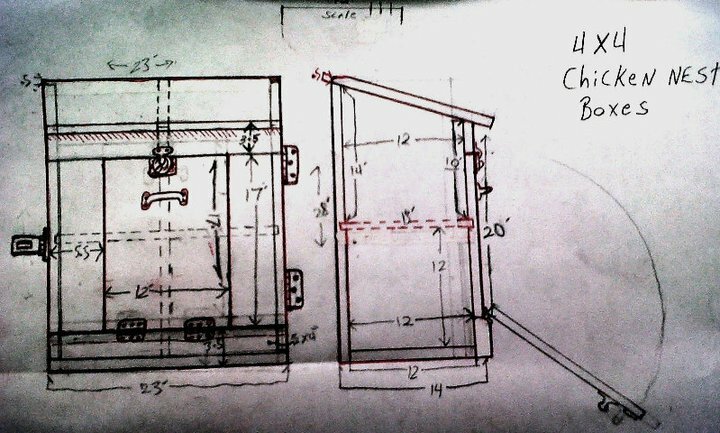 The Schematics for the nesting boxes for the coop. The door opens from the outsidefor egg grabbing. 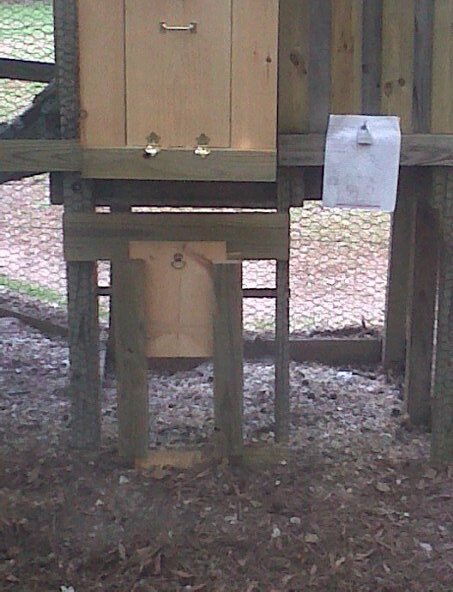 The big flat side is open and faces the inside of the coop. 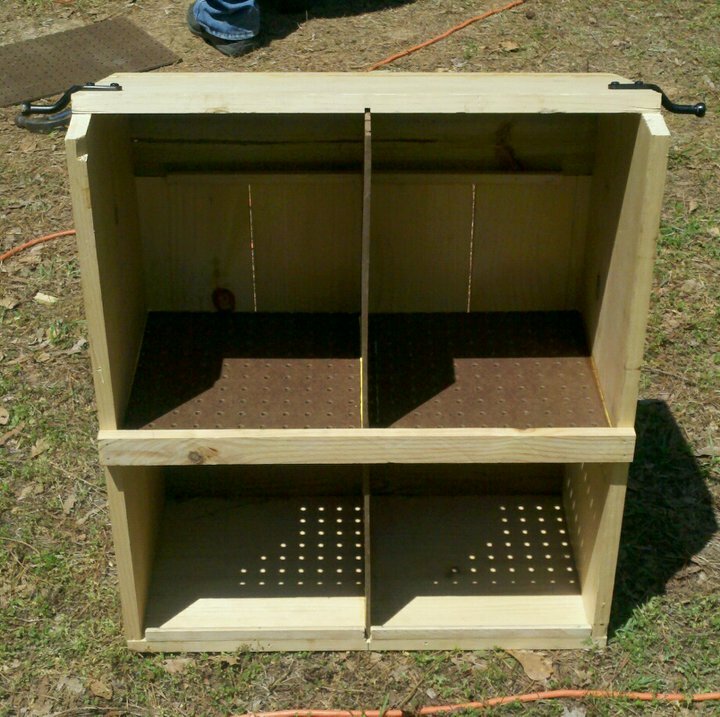 The entire box also opens like a door for easy "hoseing down" cleaning access to the inside of the coop itself. I would normally have taken this day off..... and gone to CHURCH! Chainsaw off the post in the back that are too long. you must make one that is perfect and then copy the parts off that original. then you must litterally clamp the copy's parts too the original before you nail it together or you NOTHING will match when you install it. 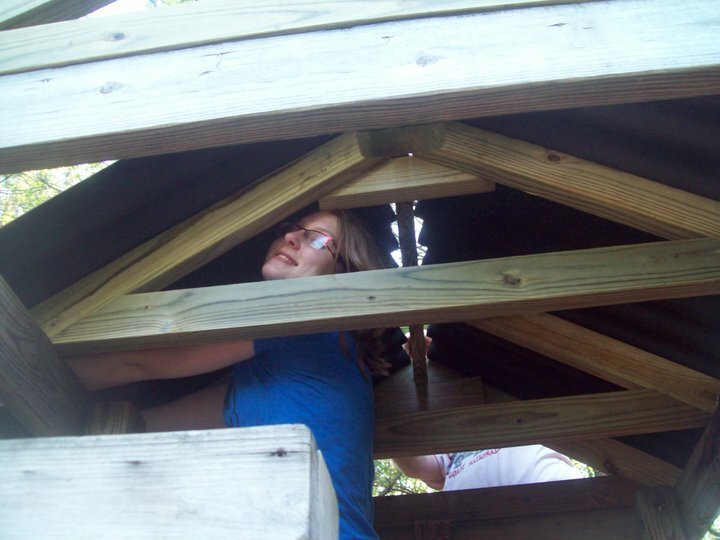 This is my daughter "holding things togeather" as I set the roof frams to be under the lower part of the Ondra materal's wave so the nails will work. 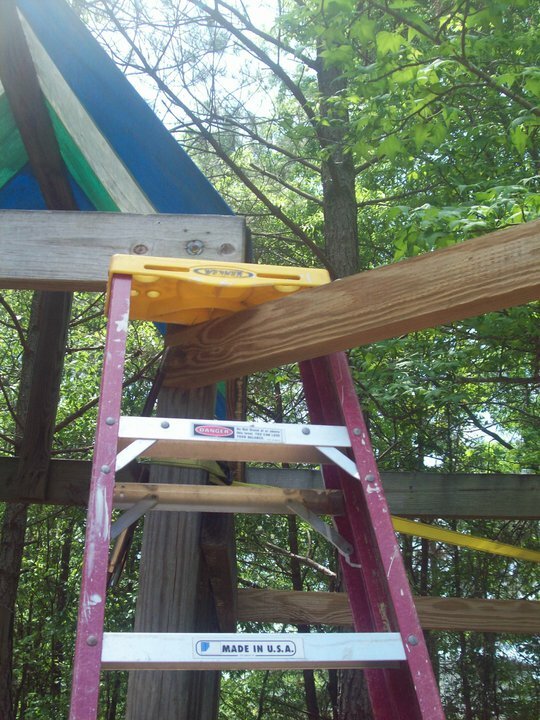 Nailing on the roof with a little ladder safty. I was worried about ventilation, especially when I board up most of the vents when it freezes. I didn't want my 9 chickens to humidify and potentially mold up the coop in winter, but I also don’t want them to freeze. 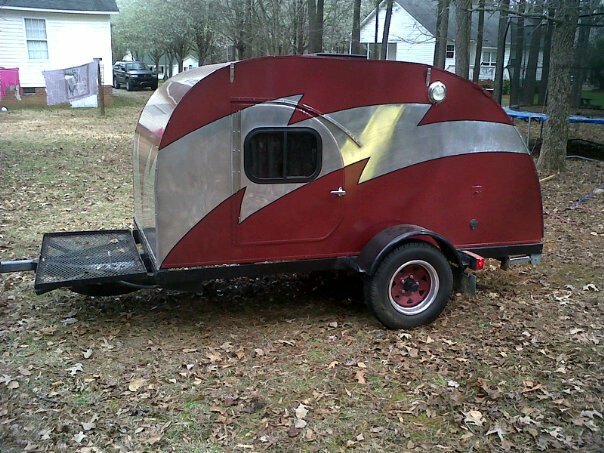 I also happen to own a vintage custom painted 1940 teardrop camper. 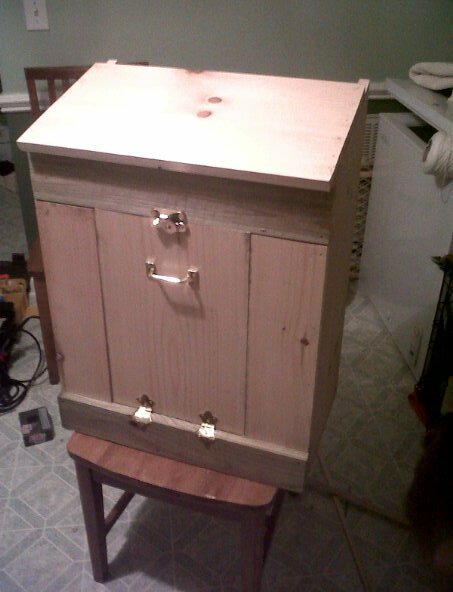 Which uses an adapted "pet-cool" A/C and heating system. which is custom fit into our campers ceiling fan so that cold ac flows in from that roof vent. We do not camp in the winter! 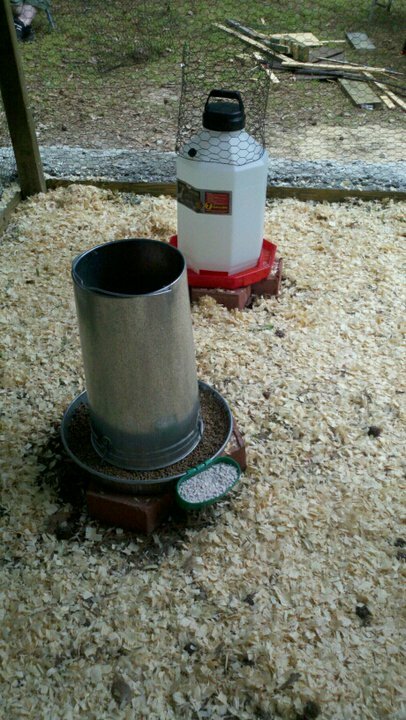 then during the winter freezes we could blow slightly warm DRY out air through the adapter into the lower side of the coop. 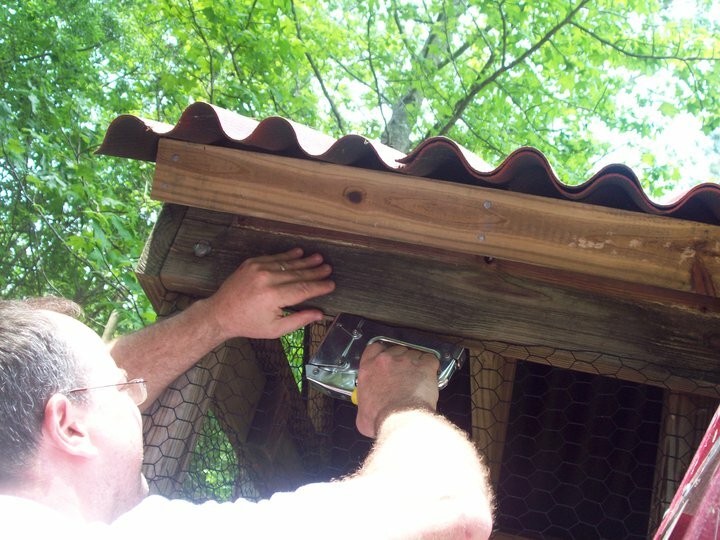 The air would warm the chicken blow softly up through the coop and out the roof vents of the coop taking the nasty coop gases and humidity with it. 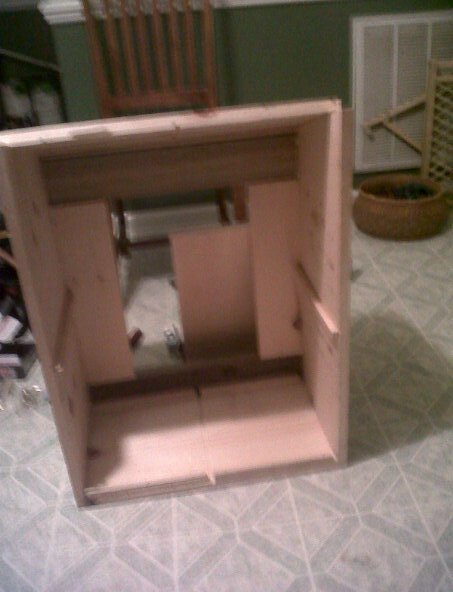 This one Is of the sliding panel to the window/pet-cool intake, half done. window open: notice the cut surrounding the window. That cut is there for a reason. check out my next photo. 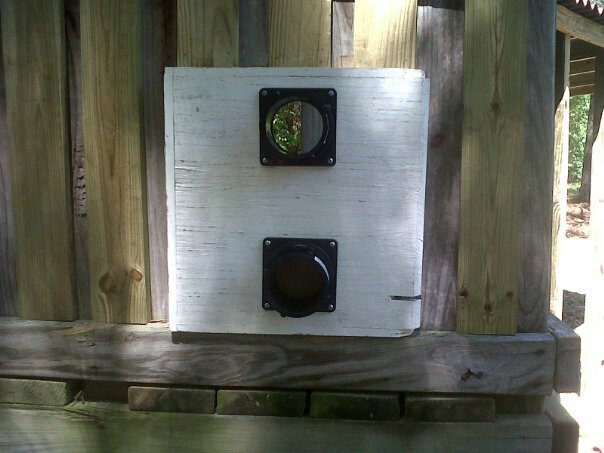 Window with our teardrop camper pet-cool adapter custom fit to chicken window. 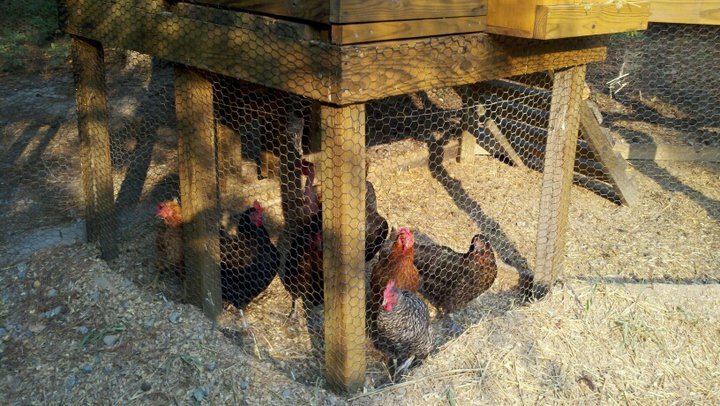 Now our chickens won't freeze in winter. I completed several other changes too, but my phone ran out of power and my wife took the recharge cord to work with her. Thus, you will have to wait for tomorrow’s light before I can take pictures of them. 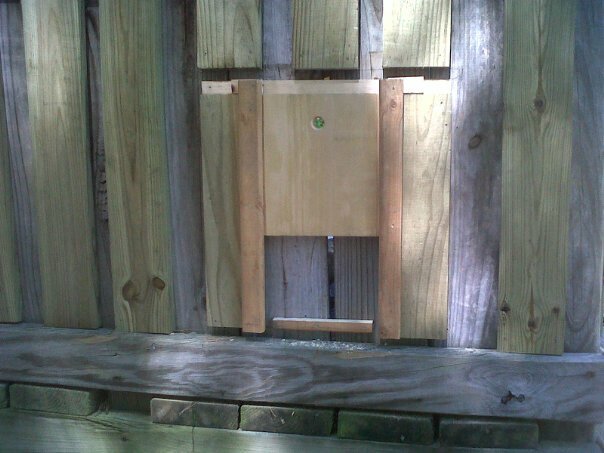 into my chicken coop nesting boxes. 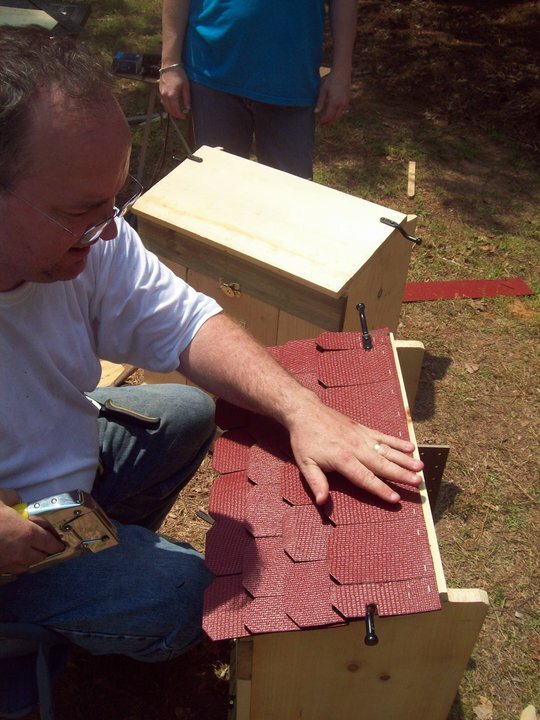 I hand cut out, and shaped the shingles on the nesting boxes, from an "ondura" roof cap strip. 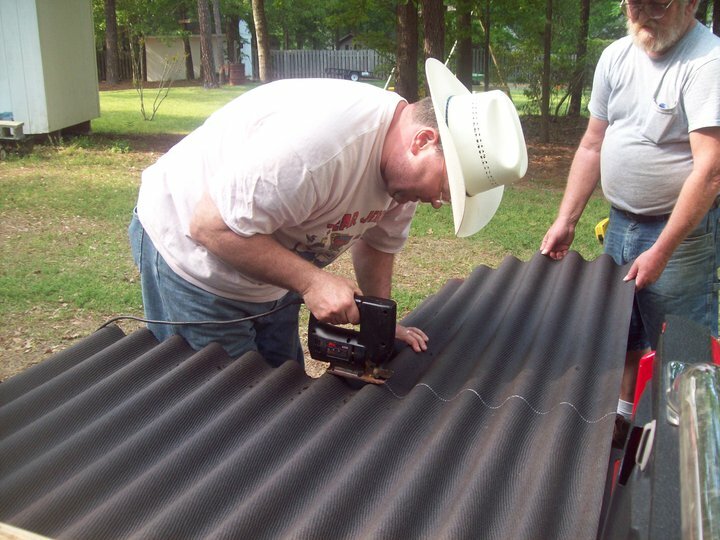 next we worked on finishing the angle of "the run's" roof. 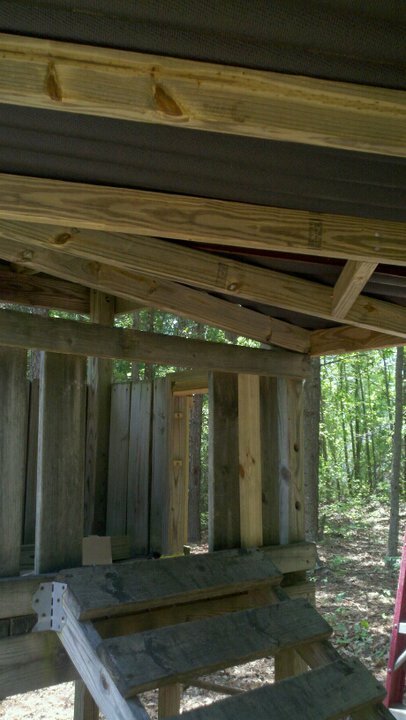 Here is a photo of the roofs new under structure. 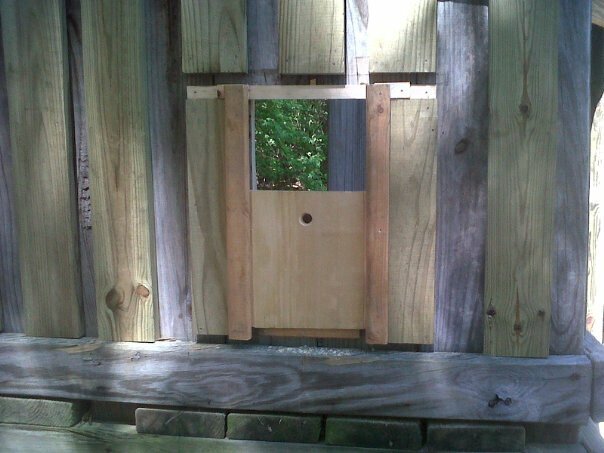 here is that kid's payset hole reduced to Chicken Size. 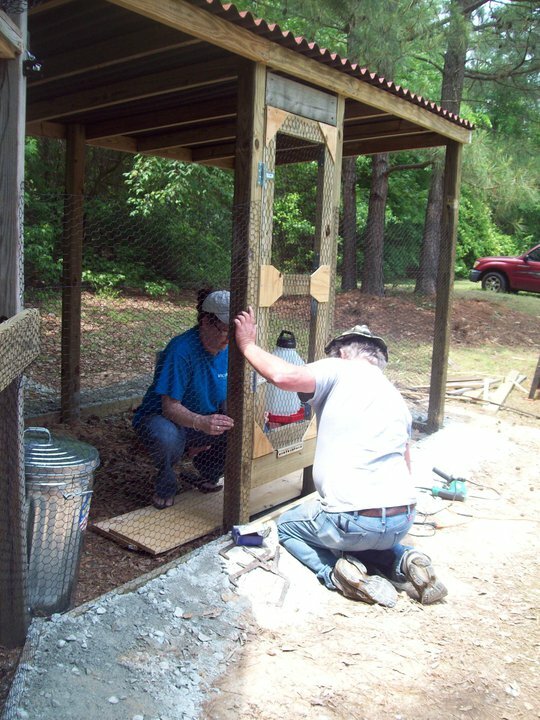 Here is a photo of the chicken run's people door instalation. Yes, I skipped church for this project AGAIN! 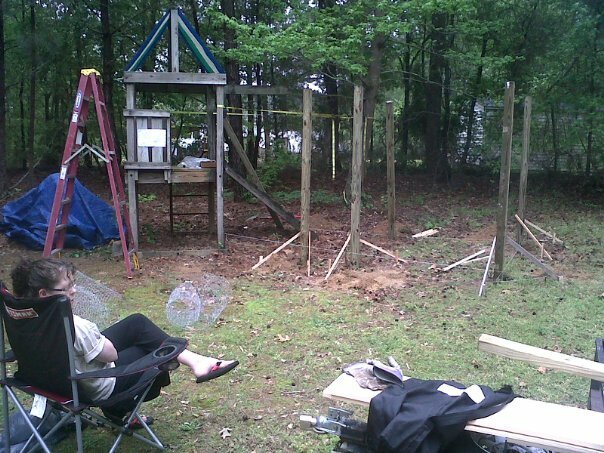 My sister in law dropped by on Sunday and took some pictures of the laborious chicken wire installation. 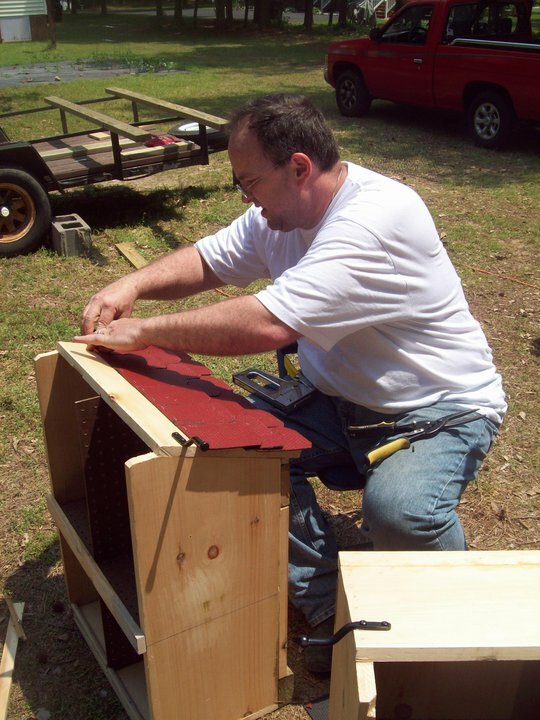 A picture of the inside of the "Pergo floored" coop. Bringing in the food and water dispensors and laying down the Diatomacious Earth, pine chips and hay. Finished enough to go pick up the chickens, but not yet done. Just WAIT to see what we do NEXT to compete this project! 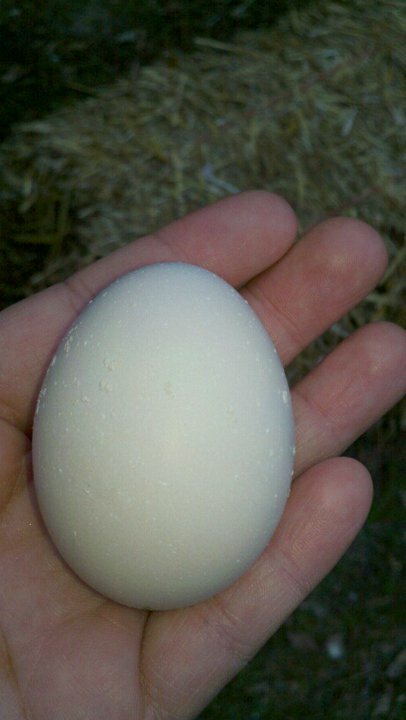 and with in 1 hour we had our first egg! It was actually still warm when we took this photo! That makes my eggs worth over $333.00... PLUS two days of hard labor, for 2 men... each egg! 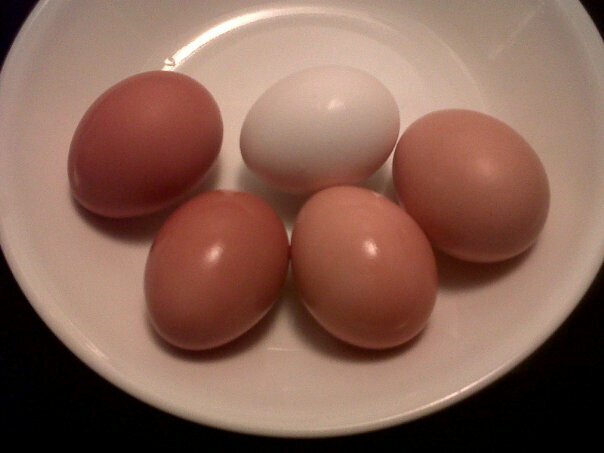 The white one is a store bought "large grade A". 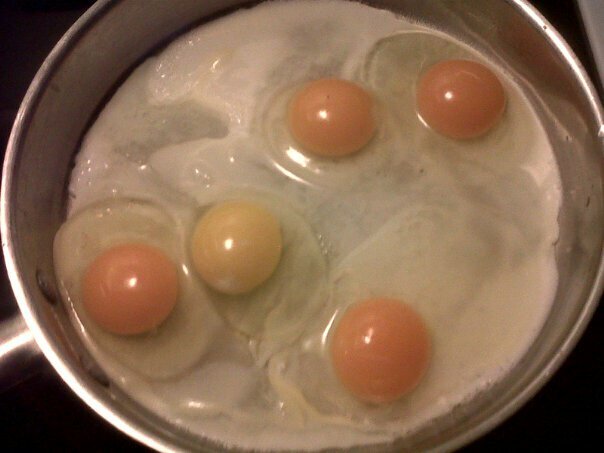 The brown ones are our chicken's eggs. Gee... which one is store bought? You know that omelet cost me $800.00 to make? 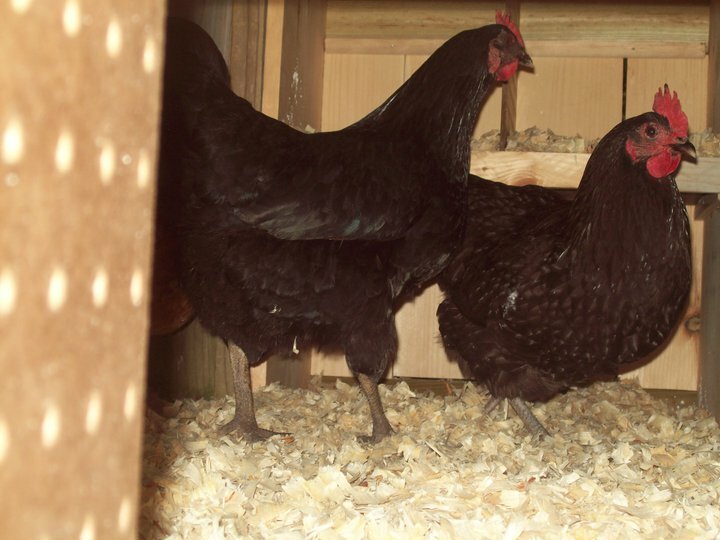 $1000 for the coop, divided by 5 eggs so far, 4 eggs used in the process. It was such an "oppulant moment"
so she too could eat a $400 breakfast this morning! I finished the tower's shutters! The wooden pegs holding up the shutters are simply this... nothing more. 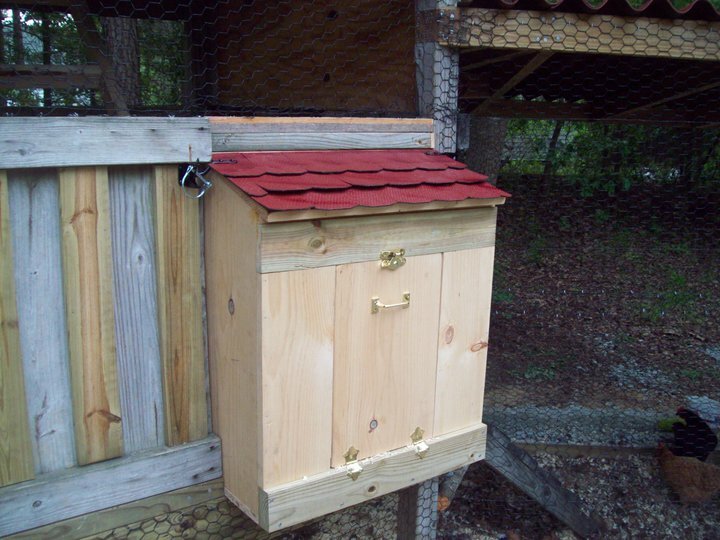 Provinding protection, warmth, and a dry coop automatically! 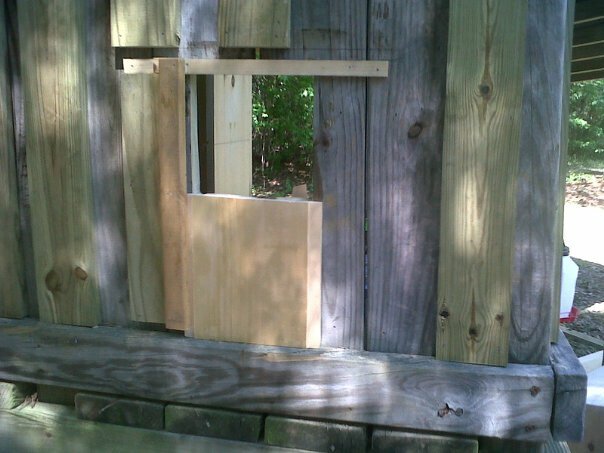 Next, I install a 2X4 "leaning rail" around the chicken run at a 4ft hight, for better structure and chicken wire reinforcement. 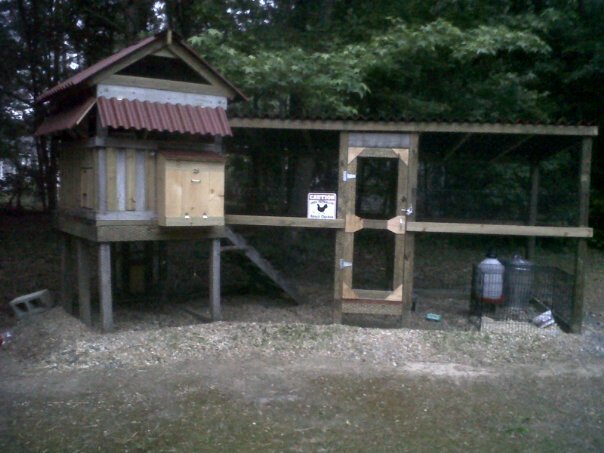 Here are some more photos of the Coop's latest upgrades! The new "Outside Playground Area" with 6 foot high reinforced chicken wire walls. This area is far from "preditor secure", but it keeps them in, and gives them 4X the space to move around. 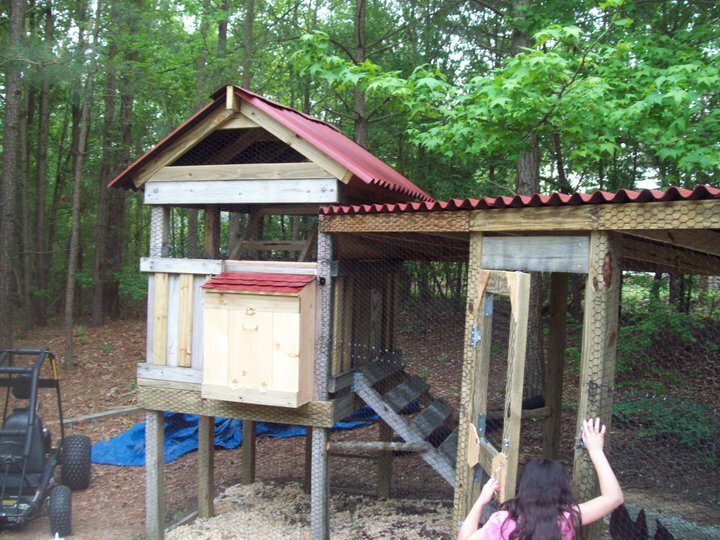 The girls only get to play in it when we are home, in the backyard, directly supervising them. 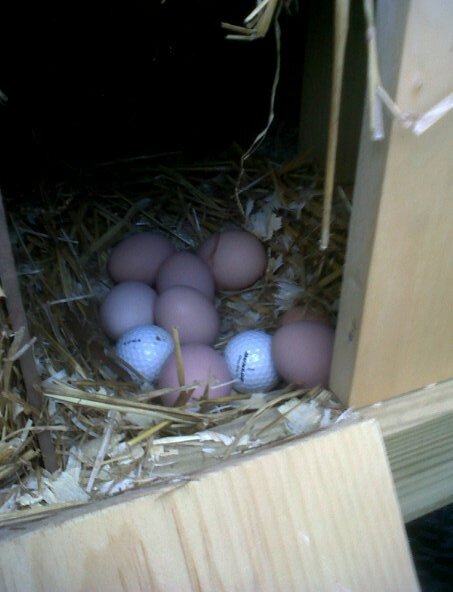 Once we installed the new "Playground" our daily egg haul has gone up from 4 eggs per day.. to 8 eggs!!! Happy Chicken bring BIGGER yeilds! and then jerking back when they realized what they were doing.. 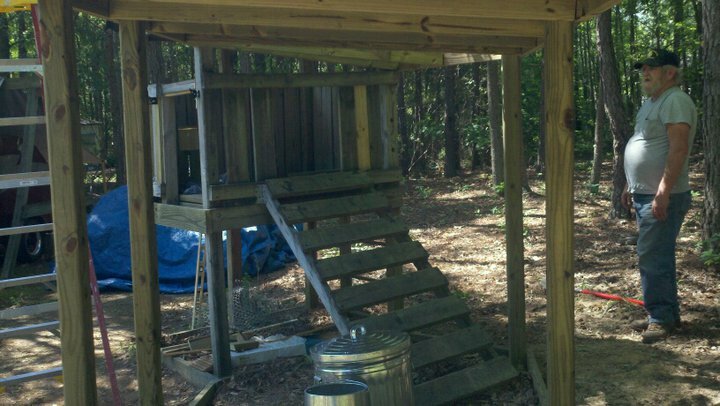 So, I built a leaning bar, so they could do so with out damaging my coop. 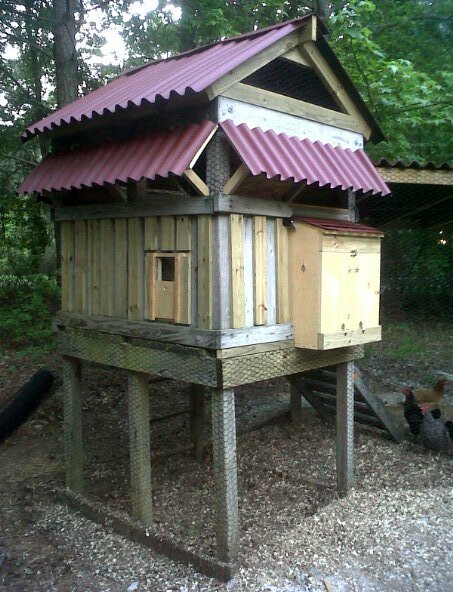 Here is the Coop with the wood leaning bar installed around it's paremiter. I just got it in the Mail today! 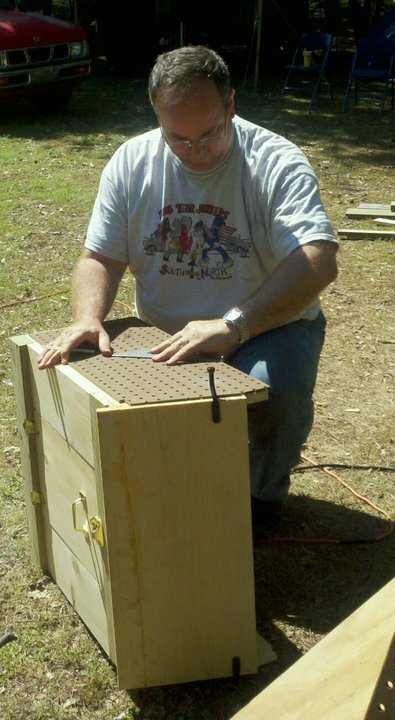 One good thing about the sumer heat, the wood dryed out much faster! So, I finally had my chance to deck stain it! 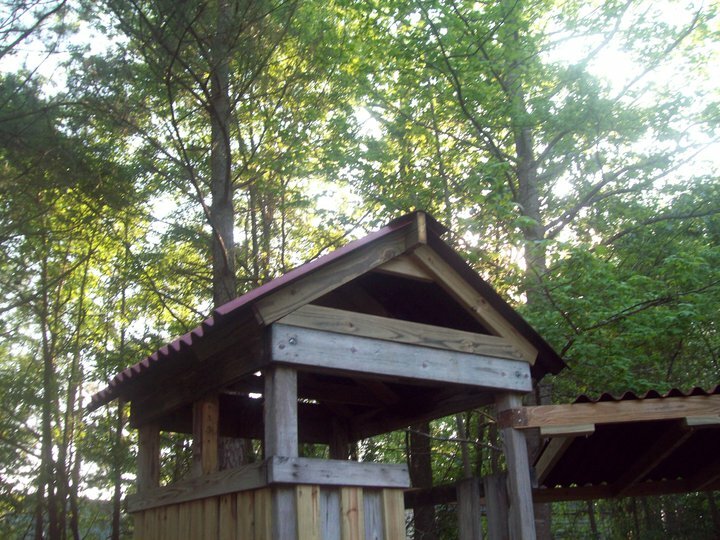 Here are some more "After Staining" photos! 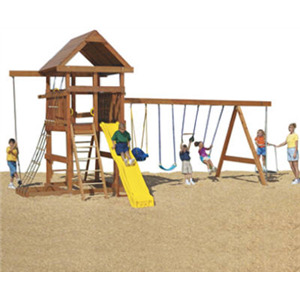 Wood stain by morning light Shaded "playground" area with hot weather pool! Put down the Camera and FEED US! The back door leading to the "Play Ground"! Mmmmmmm, Honeydew mellon.... fresh from the garden! I added a new shed attachment to the exsisting run. 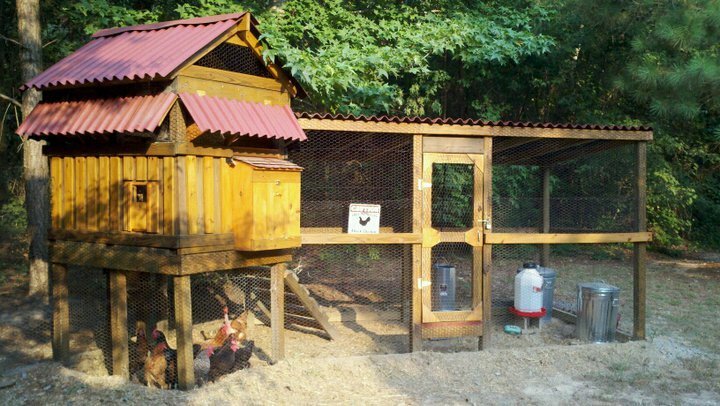 It features a new set of Holding pens big enough for any chicken waiting to join the flock, for ant quarintine chickens or a slew of 6 week old babies. Notice the back offers the penned chickens a view of the rest of the flock down in the run. This helps acclimation. 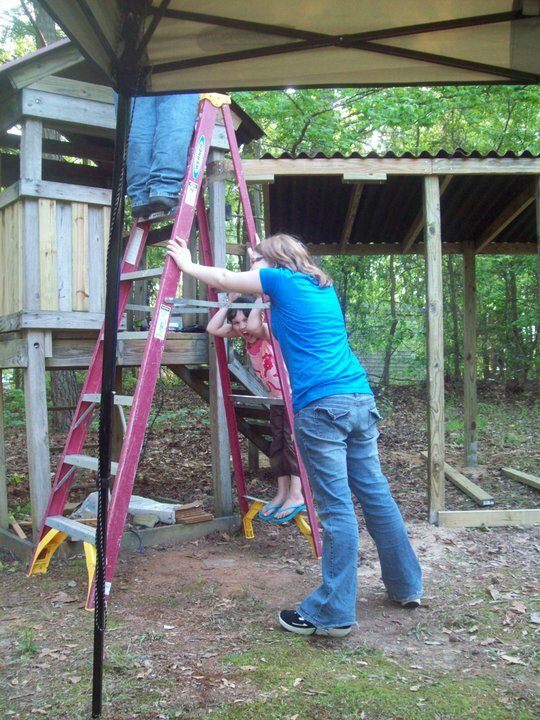 Recently, I built my own axial wind turbine and solar array to power the workshop in my shed. I found I am making far to much power and my load dump is having to waste A LOT of it to preserve my batteries. 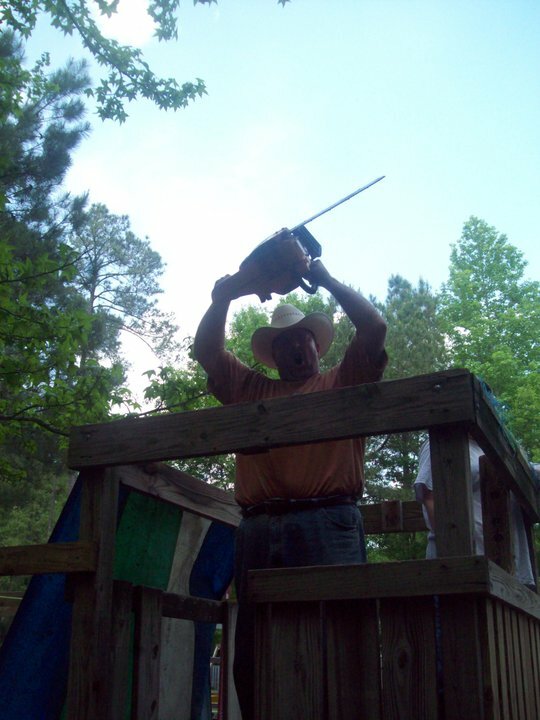 So, I figuired my Birdy Ladies could enjoy the power more than my load dump does. 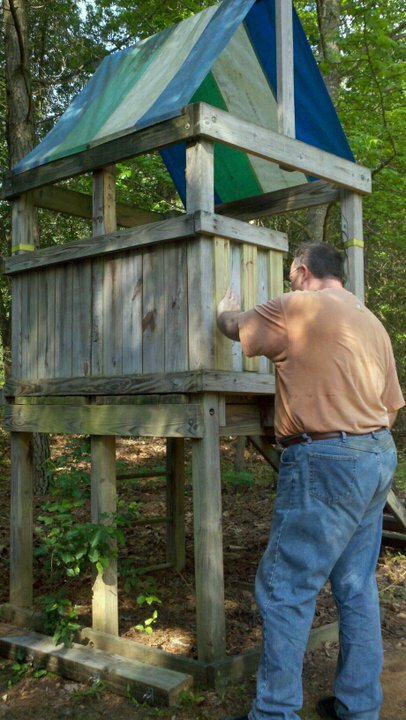 So, I hooked up our Coop to our shed. 1st. Bury the electric line from power plant to coop. 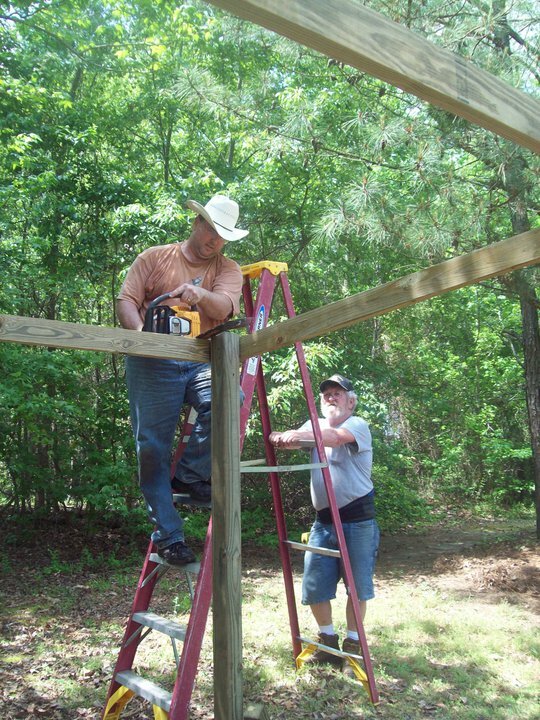 (AC travels better than DC) I used a tiller to loosen up the ground. 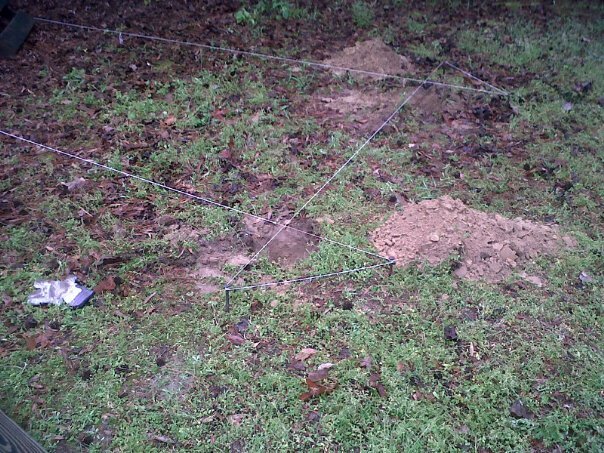 And laid out my 50ft pvc incased 12awg wire. 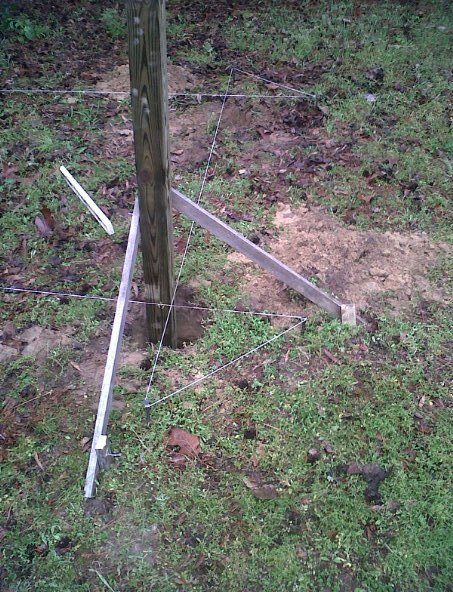 Dig out the 18" trench, bury the pvc sheathed wire, star covering it up. I discovered that ditch diggers are REAL MEN... Unlike me... but that's fine by me too. 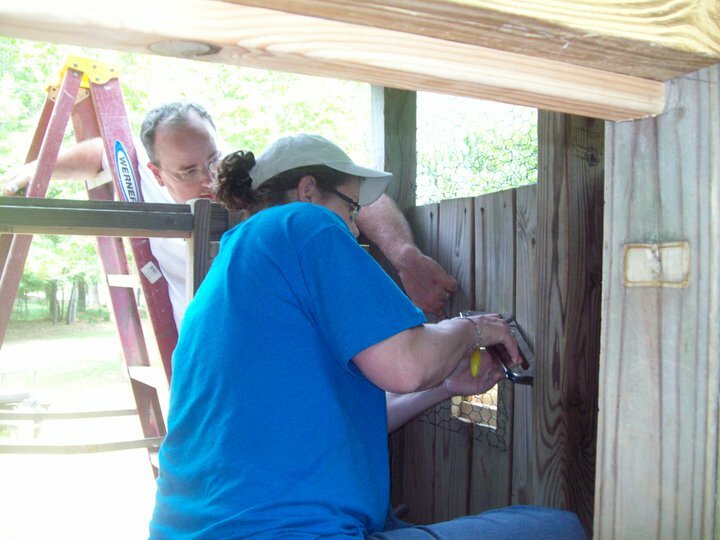 As I was hooking up the electrical outlet boxes inside the chicken coop's shed, I noticed I had spectators staring at me from the pens. 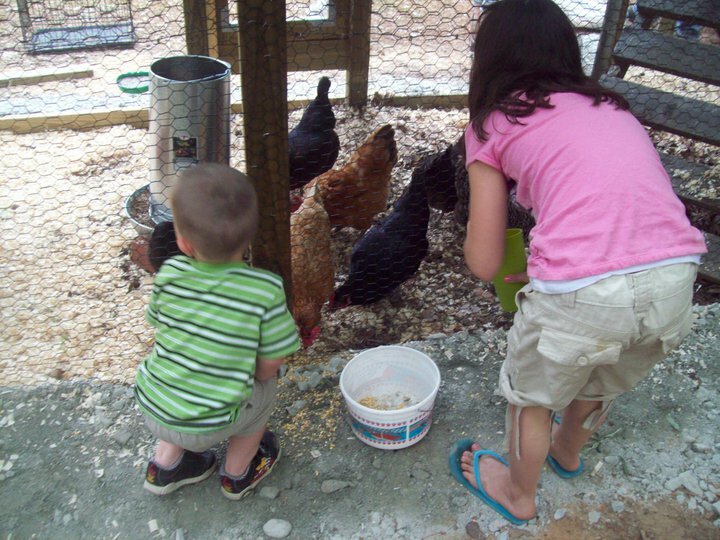 OK… our Bantams where getting their little fluffy butts kicked by our bigger chickens. 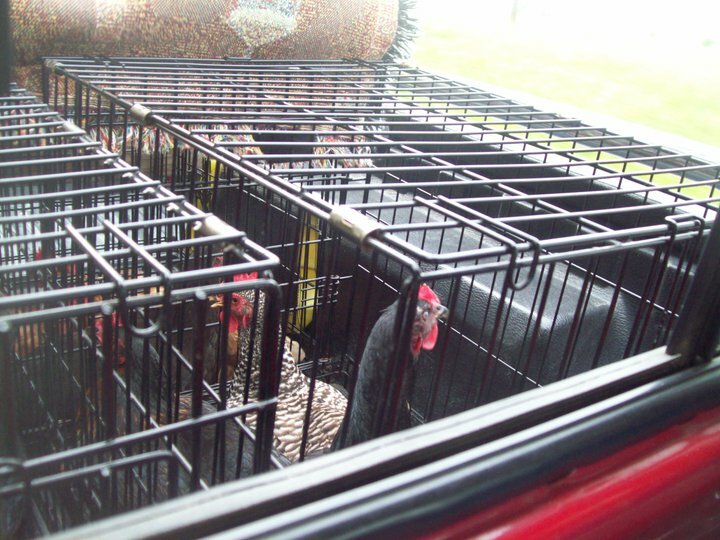 So, we are going to separate out the bantams and let them form their own flock. 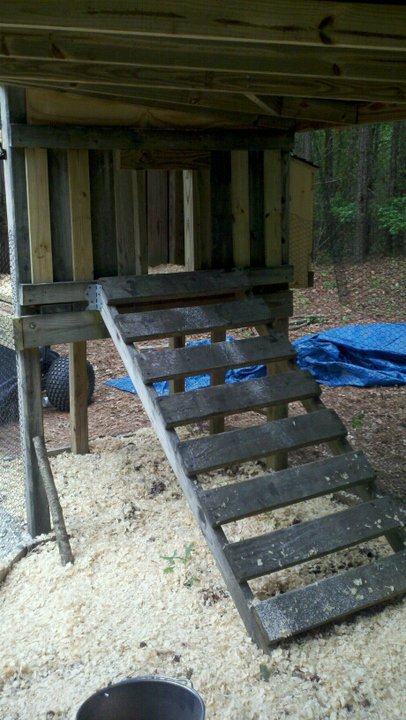 But THAT means I gotta build a separate coop and run… Oh God, Save me! 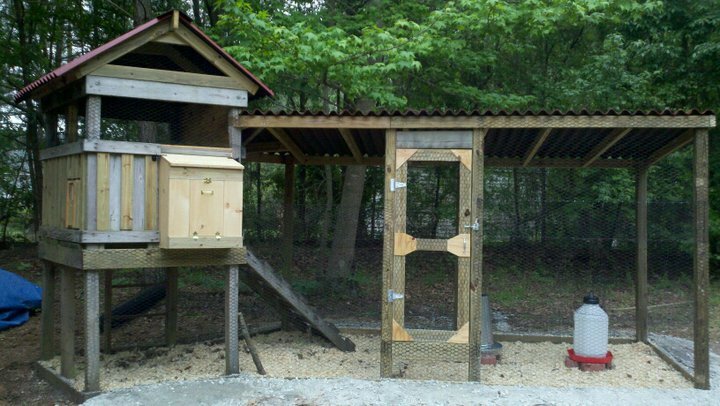 Here are the latest changes to our hopefully no longer expanding Chicken coop. 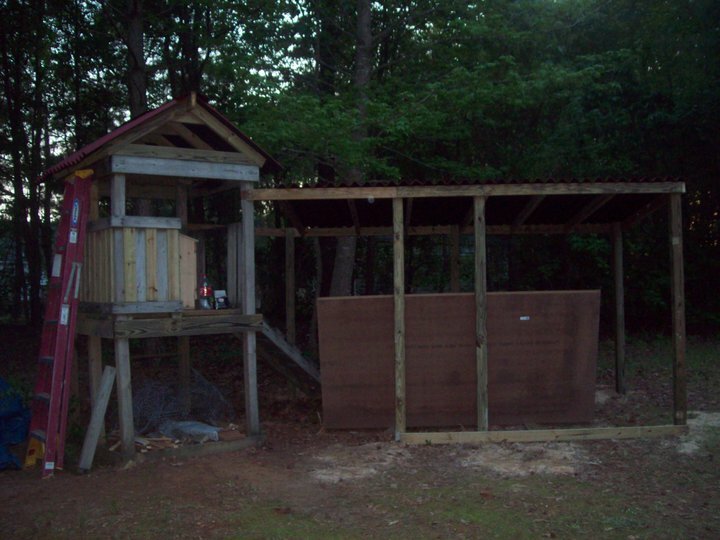 As you may remember, we built two chicken pens inside the shed part of the coop. 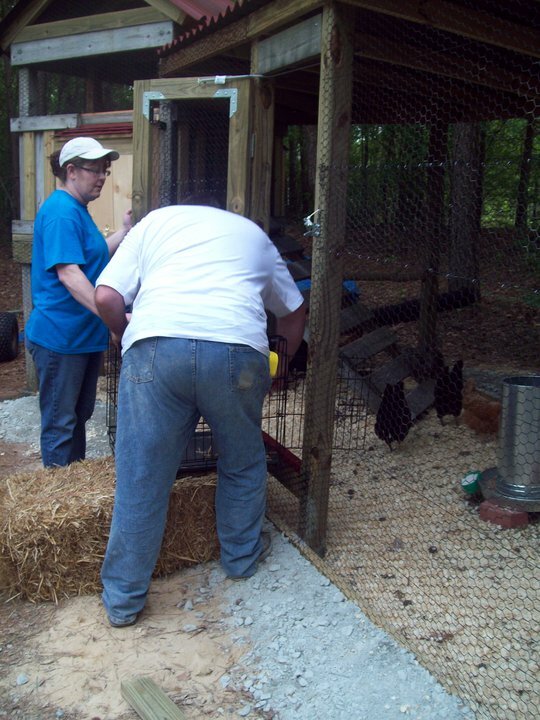 we tore out the separator wall and expanded the top up into the rafters which turned the two pens into one big space, which will become the bantam’s new coop. So, how do these little guys get to their separate run? 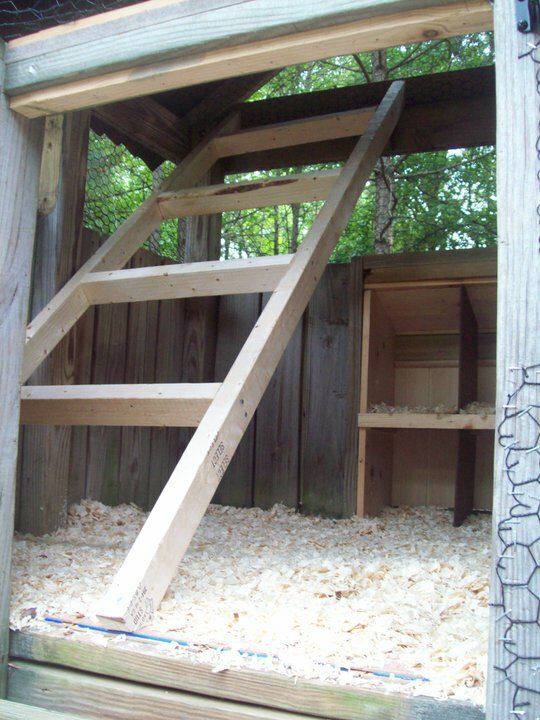 The answer: Think of a “Hamster Habi-Trail”! That’s right, we added a hallway coming out of the new coop running across the old self of the shed through the opposite wall to access the run. Here is the new sliding door at the end of the hallway that opens to give our bantams access to the run. 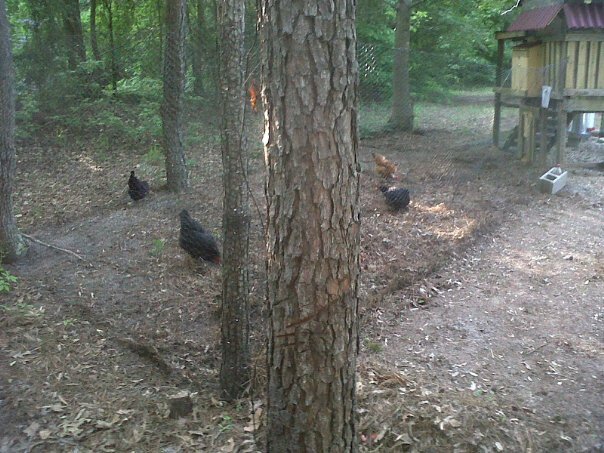 Looking down the bantam hallway from their run towards their pens/coop. Check out our Golden Sebright in the hall… how cute is THAT! 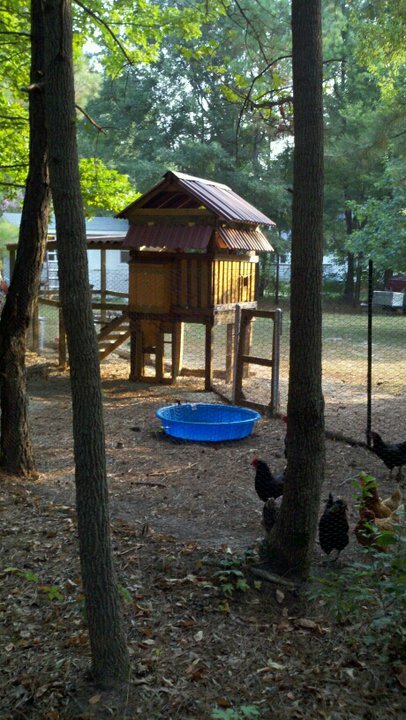 Next, lets discuss the bantams New, out door, filtered, watering fountain. 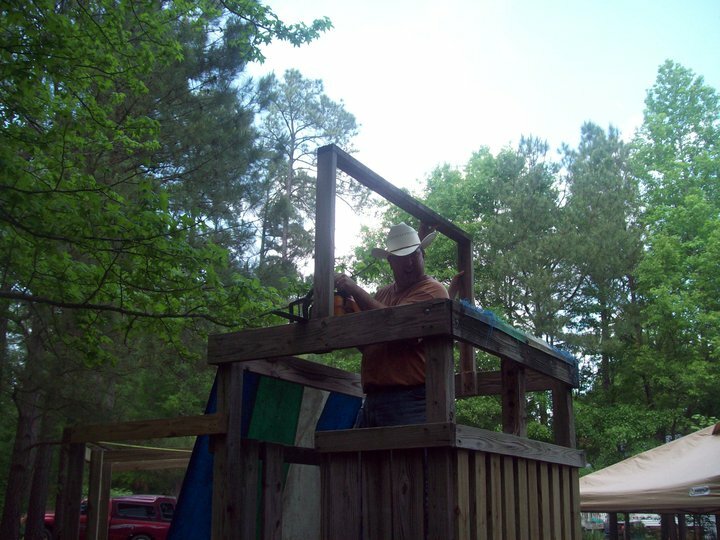 Finally, the bantam’s new outdoor run construction. Notice the Totally Cool stairway going up to the hallway door? 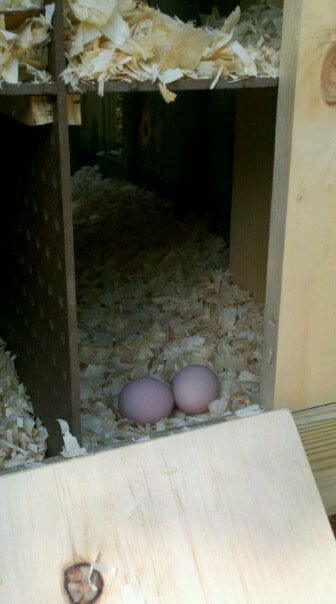 This is a photo of 1 out 3 baby Bantam Chickens. For whom all these goings on and hair pulling is for. 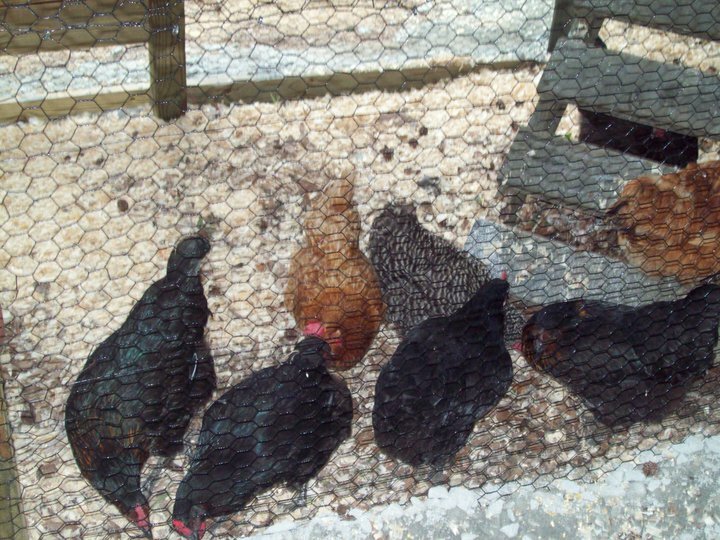 You have heard of chickens being “underfoot”. While working on the run, this one became "under arm". Teaching the new baby bantam how to use the new water fountain. With the “experienced” Golden Neck Bantam looking on in approval. 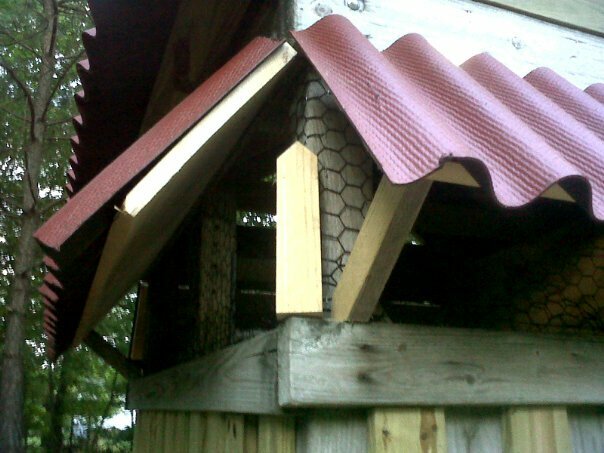 Here is the new Bantam run with it new roof installed. 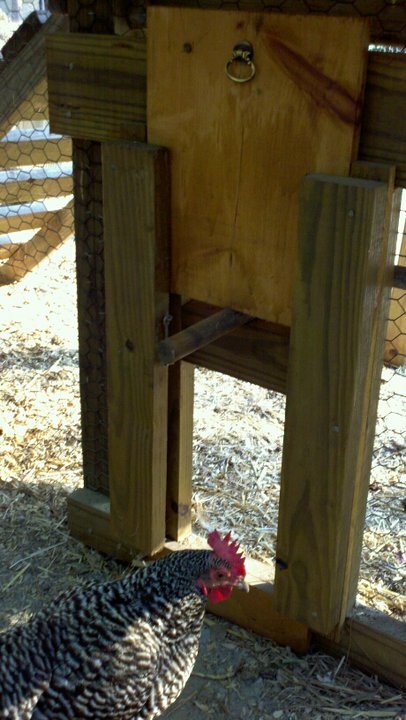 but these adolescent (previously pen-bound) bantams are not so good at their acrobatics yet. and be forced to "go outside" to eat. 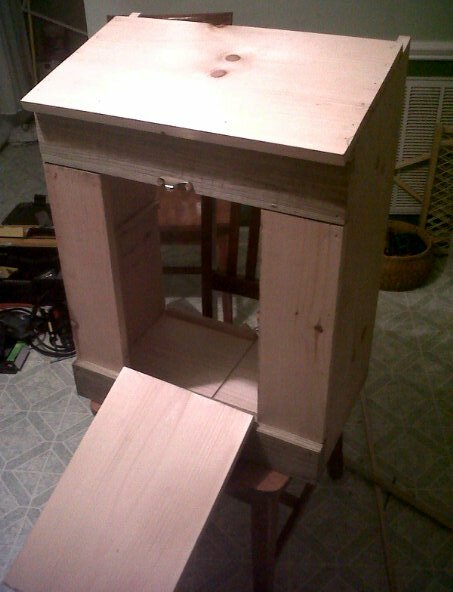 Bantam coop’s new sleeping roost latter. 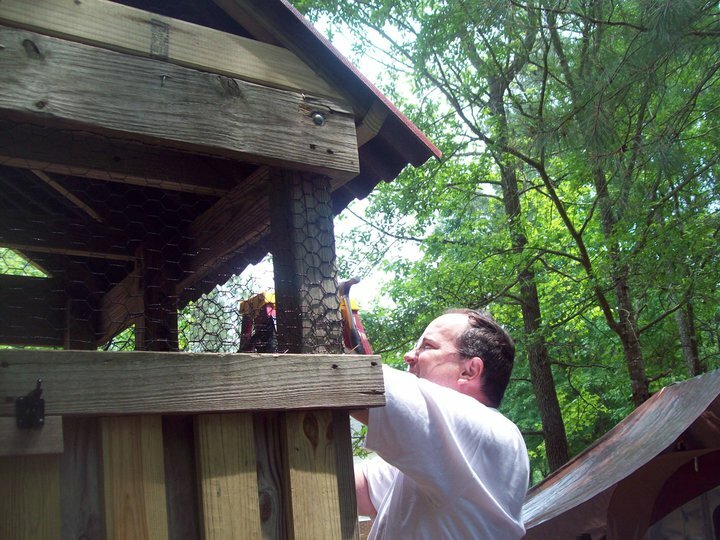 Remember, I have the chicken coop powered by my solar/wind array? I can manually turn on the coop, but I also have to manually turn it off again too. Well, when working with batteries, which I am, if the power gets used up past a certain point you do extreme damage to them. 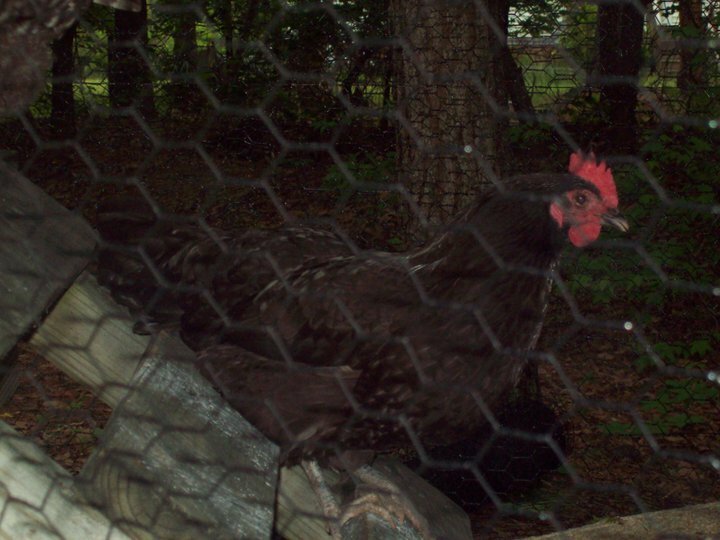 So, Leaving the house with the coop on could be very BAD if the it became overcast while I was away with no ability to turn off the coop and over drew the power in the batteries. She told me "I didn't start them up, they just started up on their own." I looked at my watch and it was just after 5pm... Excellent! It is a clear sunny day today. Even with the missing photos of the bantam add on this is well enough documented to help people out. 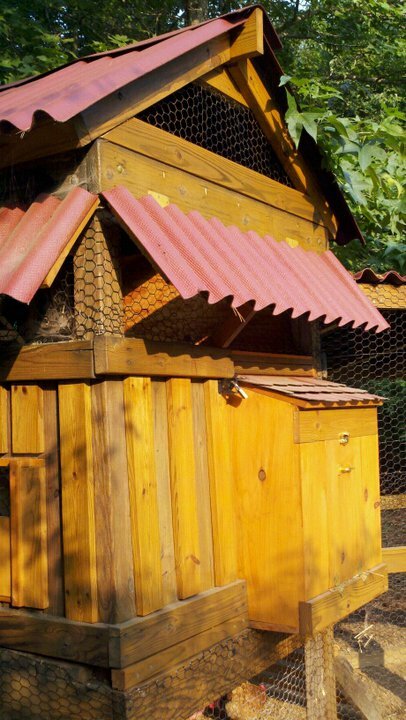 This is a not only a fun idea for housing chickens, but it is also a very informative and highly visual coop page! 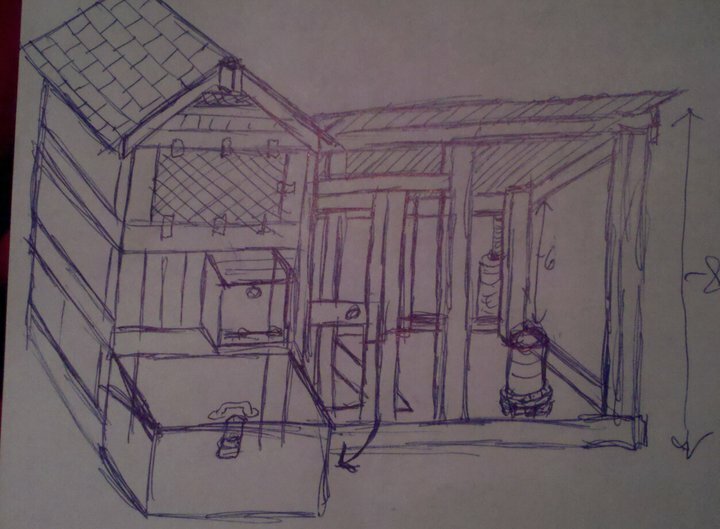 I wish my coop was closer to the house so I could have electrics because my coop gets hot! This is awesome! Sadly, none of the photos of the watering system are working. I'd love to see that! Wow I guess I have found out the difference between city chicks and hick chicks haha. wonderful job! 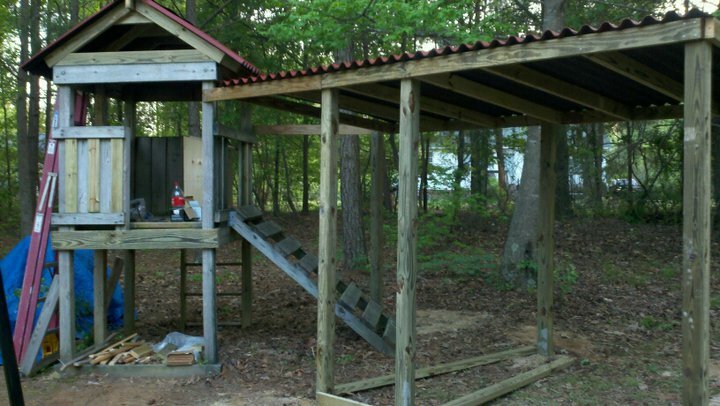 it look pretty & functional and I love how you keep adding without compromising the design! and yes that golden segrigth is beautiful, as well as the other girls! Awesome!!!!! I love the golden sebright.. very beautiful bird!!! 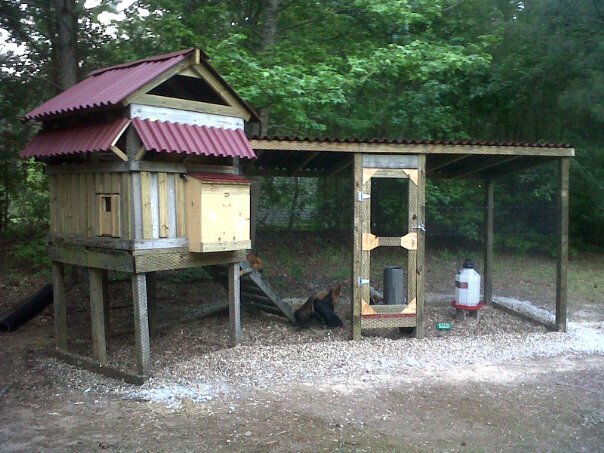 NICE i love this coop!!!! I love this! 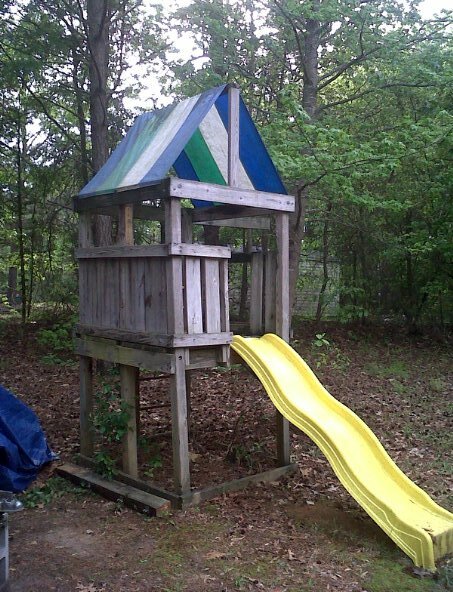 Now I know what to do with my playhouse when the kids grow up! I, too, love your rain barrel, waterer. That's the greatest water system I've seen so far! 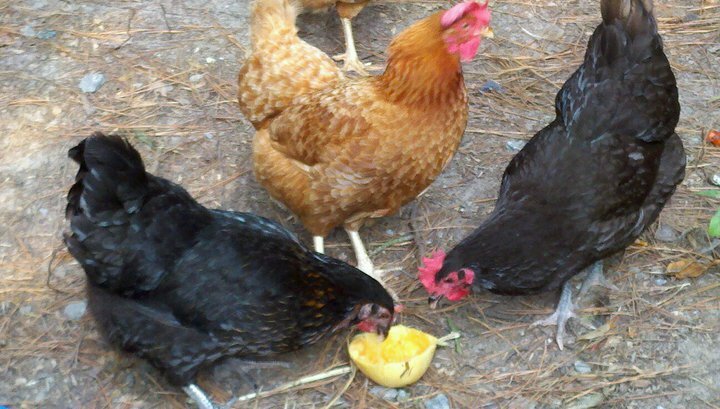 You might want to add some ACV (vinegar) now and then to your barrel to keep potential mold or fungal growth from happening, & it's good for the chickens' health too. This is awesome!!! I really enjoyed your photos! GREAT job! I'm sooo using your water barrel/thingy design! It's soo smart!